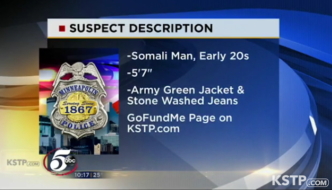 Jihad Watch : The Minneapolis papers have ignored this story, and the only identification of the attacker as a Somali Muslim migrant comes toward the end of this video report. The Minneapolis media seems determined to ensure that no one get a negative impression of the Muslim migrants as they continue to flow into the area in large numbers. A Minneapolis woman who was stabbed 14 times while walking to her Uptown home said she is doing better and is focused on helping police catch her attacker. Twenty-six-year-old Morgan Evenson said she was attacked Dec. 13 while walking home from her job at the Apple store on Hennepin Avenue. “I cannot imagine anyone attacking someone like that and as a woman it is especially frightening, but I knew I had to fight back and I want him to know I am OK and that he will be caught,” Evenson said. Evenson said she is extremely grateful to neighbors and passersby who heard her screaming and came to her aid which, she said, ultimately led to her attacker running away…. A GoFundMe page has been established in Evenson’s name. Europe, end the double standards!